The BFGoodrich Radial T/A tire has been a favorite with muscle car owners for around 40 years now, and the classic look and feel of this tire make it easy to see why. The unique tread design and those raised white letters, or black sidewalls, take you back to a time when muscle car performance was what it was all about. 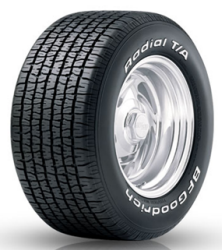 But don’t think that the Goodrich Radial T/A tires are just something out of the past. They have an all season tread compound to go with g-Wedge technology to give cars of today better performance and handling capabilities. BF Goodrich Radial T/A prices range from less than $85 for a 14″ series, to a little over $150 in the 16″ series. Who Is The BF Goodrich T/A Radial Tire For? The BFGoodrich Radial T/A tires are designed for drivers of muscle cars, street rods and light trucks who are seeking a wide, classic looking low profile type of tire. With sizes from 70 – 60 – and 50 series, finding the tire for your particular vehicle is easy. The T/A Radial has a 6 year materials and workmanship guarantee. The first year is free replacement, followed by a prorated warranty for the duration. A uniformity warranty of one-year/first 2/32″ of wear is also included.